Popping in with a quick card for Muse. I loved the bold red with the black and white in Michelle's card. I stuck with that same color combination, but in a more layered style which is not my norm. I think my reds make the amaryllis look quite velvety. Its a bit wonky, I know. I still like the card and am submitting it. One last card for the weekend and possibly for a few days. I have a couple of crafty dates early in the week so I'll probably not get much posted. When I get ready to color flowers I haven't colored or have seen in real life I check google images. I was surprised to find a blue amaryllis. Since I am not quite ready for the Christmas cards yet, I jumped at coloring this WPlus9 Amaryllis stamp in blue. This had to be a one layer card for Less is More Challenge 380. I stamped and embossed the flower on a folded piece of bristol not quiet square. I used Arteza markes and a water brush to color the flowers. Afterwards, I hand drew a frame around the blooms attaching it to the sentiment under the flower. It kinda reminds me of an art print. I am catching up on a lot of challenges this weekend. 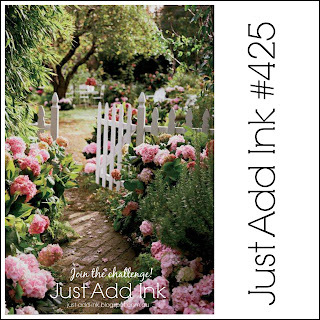 This card was made using inspiration from both the Color Throwdown Challenge 511 and the Photo Inspiration over at Addicted to Stamps and More challenge 310 . 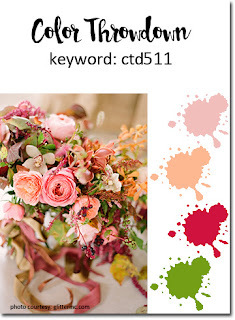 The colors for the bucket of bloom come from color throwdown, the planking panel and the green bucket of blooms also come from the photo inspiration photo at ATSM. Its been a crafty Saturday and this is my third post today. 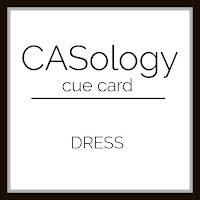 Kim Heggins is our Muse this week her card is below. While I have the stamp set Kim used, I couldn't completely case her card. So I just 7/8's cased it using kitty cats. Her design makes for a darling patterned card, so I had to go along with it. 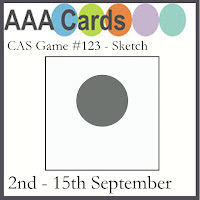 I am playing along at CAS Colours & Sketches and Casology. The lady with the dress and balloons is from the Stampin Up set Hand Delivered. Its a fun set with the bottom of the dress half and several top halves. This time I chose the balloons for a birthday card. The white heat embossed sentiment also comes from the set. And probably faster than I'll be ready for it. 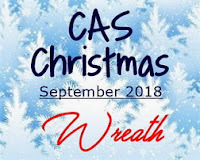 I'm playing along with CAS Christmas Card Challenge where the September prompt is Wreath. I recently purchased the Stampin Up set Wishing you well. And unlike most of my purchases I wanted only one stamp in the set...that organdy bow. Now that I have it in my hands, there are a lot of possibilities with all the stamps. I stamped and masked off the bow first, I didn't want any green under that gorgeous red bow. To get just a bit of relief from all the white I dry embossed the card base with another SU ef that puts a linen texture onto the card. The sentiment comes from Simon Says Stamp. Another entry in my monthly Bizzare Day series. This one is for September 21st International Gratitude Day; heading into fall it seemed the perfect day for a card project. This new to me Concord and 9th stamp had been on my wishlist quite a while. As fall was approaching I bought it. I decided that if waiting over a year it still pulled at me - it was a good purchase. These cards are for my Dad's Birthday. One from me and hubs and one from the cats. I think my Dad gets a kick getting cards from the cats. They seem to live longest on the front of the fridge. I'll be entering the cat card to Always Fun Challenges - Fall Colors and both to Seize the Birthday with the toppings of using a punch or die cut. Another challenge beckoned me. 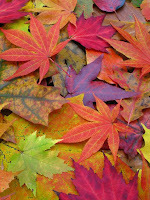 The fabulous fall colors over at Color Throwdown had to be played with. I started with a full sheet of SSS Khaki cardstock. I cut it down for 1 card base and 2 panels. One panel was diecut with a stitched edge and I cut three of Lawn Fawns stitched leaves out of that panel. On the second panel I cut full leaves and the sentiment strips. I colored the leaves with copics, because the coloring was on the khaki cardstock the colors seem deeper to me. I covered the leaves once dry with wink of stella and then clear embossed them for some sheen. I placed the back into the die cut space but allowed the smaller leaves to lay upon one another. The sentiment were added along with some sequins in fall colors. Then the panel was popped up on the card base with fun foam. I am entering the card to two challenges. I am beginning to become addicted to watching the skies lighten as the sun comes up. Its so quite out. This card is for The Card Concept. I'm calling my card clean and layered. I colored strips of paper and adhered them to the card base. Next I cut two layers of the daisy from 110lb cardstock scraps. I added the daisies and a quick sentiment to finish the card. Another early morning crafting session with some techniques I rarely use. I started with watercolor paper. 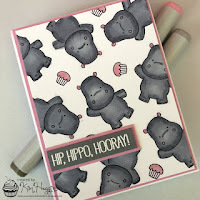 This new to me Penny Black stamp was colored upon with Tombow markers. I spritzed the stamp lightly and then stamped it down onto the paper. I stamped the leafy area first then using the same technique the flowers using an orange and a deep yellow. I dried the entire image with a heat tool. Once dry I prepped it with powder so I could clear emboss over the image to give it some texture and protect it. Once the image was clear embossed, I added some broken china distress ink with a brush to add a bit of color to the back ground. I then spritzed the entire panel with a clear shimmer spray. Once it dried again, I die cut the panel to fit a square card. I added a sentiment to finish the card. 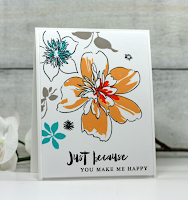 CAS Mix UP for September - stamping with markers, heat embossing, ink blending with a brush, resist, die cutting, and spritzing. I have two cards for three challenges today. I am using sentiments from MFT and a leaf die from Concord and 9th. I started by putting down distress oxide inks in Candied Apple, Peeled Paint, Wild Honey and Spiced Marmalade on to a sheet of Neenah solar white. After cutting several leaves, I prepared two card panels, one squared sized with a pierced background from Altenew. Then I made a 7 petaled flower by arranged 4 1/2 leaves with their points in the center of a circle. I added a white heat embossed sentiment over the flower. For the second card I sponged some Candied Apple in a banner across the card front. I added score lines above and below it. I adhered three of the lighter multi-colored leaves over the inked portion. A small sentiment was heat embossed over the inked panel. 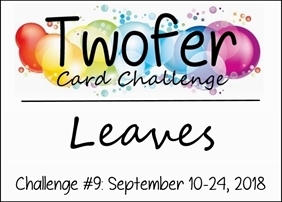 These cards were inspired by three challenges - Twofer Challenge - Leaves; City Crafter Challenge - Autumn Colors; and a sketch challenge from AAA Cards. Another card from a late night/early morning crafting session. 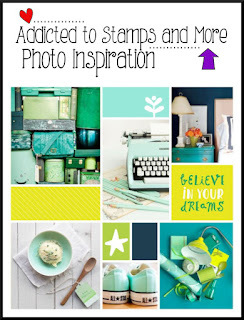 When I saw the inspiration photo over at Just Add Ink, I had to play along. This challenge is fairly new to me - this might be just my second time playing along. I decided to use my Hero Arts Rose Stem, heat embossed and colored with Arteza markers. I used a peachy shade and a pinky shade. I colored the petals ping at the very bottom and peach at the outer ends of the petals. Then I dropped clear water in the middle and encouraged the colors to play. I love the glow it gives the rose. I was inspired by the gorgeous peonies and I added a white on white die cut, as a nod to the picket fence in the inspiration photo, for my rose to rest upon. Its about 4 am eastern daylight time here in Maryland. Hubs says I am on vampire hours again. He came in to tell me good night and pronounced that I looked anything but sleepy. I decided since I was awake I'd rather do some coloring than binge watch tv until I fall alseep. 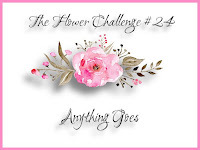 It is an anything goes theme over at The Flower Challenge, and I'll be submitting this bloom there and to CAS on Friday - their theme is Flowers. This was stamped and then clear embossed. I colored it with arteza real brush pens. A bit of gold spatter and mountingto a coordinating card base finishes off this card. I've got a couple of sunflower cards to show you and one of them needed to be reworked. Fortunately I have the before and after versions to share. I am entering the cards at Shopping our Stash - Crazy for Coloring. 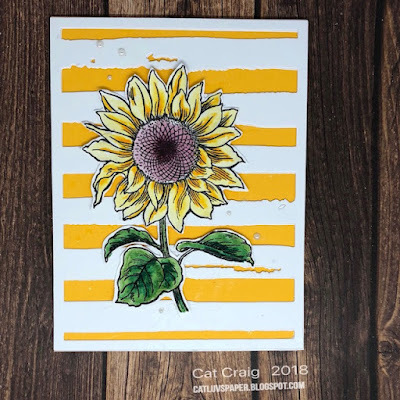 I used zig markers to color the sunflower from Stampendous. My friend had stamped these lacy shapes on to a card panel and it was a warped rubber stamps it had missing bits all over the middle. It is also wood mounted. She was about to toss the panel and I asked her if I could use it. The sentiment stamp came by way of a large box of stamps sent to me by a blogging friend. I think the sentiment is from Reverse Confetti and I thought it perfect for this cardfront. Where I had decided to add nuvo drops...BAD IDEA it looked out of whack somehow. So I pulled off the flower which by now was a good day old on the glue drying. Fortunately, it came up okay. I then scraped off the nuvo drops, cut another painted strips cover plate. Glued it over the first one, re-glued the sunflower and added some pearls. Much better, don't you think? Since there was so much going on outside, I put the sentiment inside - it reads thanks for brightening my day. Thanks much for popping in. I still have two flower stamps that need to be used before I'll let myself touch the fall stamps and dies. To make this feel like fall - I used a good strong orange by mixing orange, red and yellow Arteza Real Brush Pen colors full strength on Bristol paper heat embossed with the Hero Arts Nasturtium stamp. To add texture, I have several layers on the card - the base, the Avery Elle Cover-plate, some inking, and finally the image mounted on foam tape. The card also had 3 shades of white card stock also adding to the textural feel. My sparkle bits are the flat sequins added to the center of the card. There was another challenge - but it requires creating an account to use the linking which no doubt will require that the linking company has access to who knows what. So that one is off my list. My bestie's hubby has landed himself in bed. He answered the phone when I called her over the weekend and I thought maybe I could lift his spirits a bit by sending him a card. This stamp came to me via another good friend as a just because surprise, so I am glad to be able to put it to use. One of the crafty gals has a birthday this month and she loves RED. When I saw the colors at Color Throwdown I knew those would be the colors for this card. I just used MOSTLY red. I am using two Simon Says Stamp stamps - Big Scripty Greetings - the line weight is perfect with the flowers; and Center Cut Flowers. The images and sentiment were clear embossed over versafine onyx black ink. The panel was die cut with a Lawn Fawn die. The image was colored with Arteza Real Brush Pens. I'm also submitting this to Simon's Wednesday Challenge - Anything Goes. I had a crafty play date with the crafty ladies earlier this week and I stamped and cut a bunch of the Pretty Pink hummers, along with stamping a Clearly Besotted Peony stamp and went to work with the copic markers. The hummers were glazed with wink of stella and they have such a lovely sheen in person.